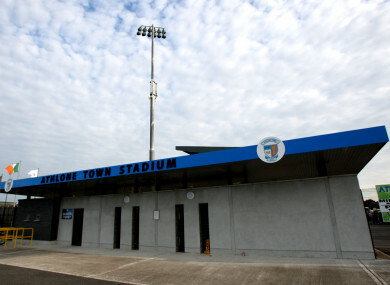 General view of Athlone Town Stadium. SIX MONTHS AGO, when Darren Kavanagh received an offer to play for Athlone Town, he jumped at the opportunity. Domestic football has served as a breeding ground for many of the country’s top footballers — Seamus Coleman, James McClean and Wes Hoolahan among others. So for many people, the prospect of playing League of Ireland football is a dream — yet for Kavanagh, it turned into the opposite. Earlier this week, he confirmed on Twitter that he was leaving Athlone Town. The club have struggled badly in the First Division this season, having picked up just two draws from 18 games as it stands. It is the kind of nightmare scenario that is not easy, particularly for a young player learning the game. For months, Kavanagh’s frustration had been building. “The last straw was when we went back after the break, trained Monday, Tuesday, Wednesday, then I got a text on Thursday before they released the squad to say they were leaving me out, because my performances haven’t been up to [standard],” he tells The42. “My performances haven’t been great, but I’d been playing in positions I’m not familiar with. “I thought I wasn’t getting a fair crack at it. Ever since I signed for them at the start of the season, I wasn’t being played in my proper position, I was always thrown into another position. Before signing with Athlone, Kavanagh saw himself as a striker or number 10. Since joining, he has played centre mid, out wide and more recently, left wing-back. He wasn’t the only one placed in that situation. The most glaring example occurred last March, when a lack of options meant 18-year-old midfielder Luke Kelly was needed to play in goals against Cabinteely. Yet Kavanagh and others being played out of position was only the tip of the iceberg as far as the problems at the club were concerned. It has been a season to forget for the embattled side. In just their second league game of the campaign, Drogheda put six past them. Since then, they have suffered 7-0 losses to both Wexford and Shelbourne. “We were starting to get better, we hit another bump after we drew 1-1 with Finn Harps. We were getting hammered 7-0 against Shelbourne and all that. The problems behind the scenes also saw manager Aaron Callaghan resign following a Leinster Senior Cup game in which the club were not provided with warm-up gear or a physio. The club is frequently portrayed in the media as being in chaos, and Kavanagh agrees that this depiction is not far off the mark. “When Aaron was there and since Mitch [Whitty] and Terry [Butler] took over, I can’t fault anything they did, they tried everything from their point of view. “In fairness to Terry and Mitch, they’ve done all they can, they’re not getting any back-up. It’s the fact that they just don’t have any money there. The only people who are in the stands are family of the players. There’s no support at all. “You have all these pages on Twitter like ‘Athlone Town fans’ and all they do is slate our results and performances and everything. In a way, I can’t blame them, because they don’t like the committee, I don’t blame them in that sense. When Butler took over, to say that the manager and his staff were facing an uphill task would be putting it mildly. Before the former Bohemians coach took charge, Athlone had one point from 10 games. After coming in as boss, he has overseen a run of one draw in eight games. The last two matches, 1-0 losses to Cobh Ramblers and Wexford, have at least shown signs of improvement, while the latter result has since been rescinded and awarded as a victory to Athlone, following their opponents’ fielding of an ineligible player. It was a very difficult situation for Terry to come into,” he explains. “He came into training and went back to basics. It has helped. It would be a good quality in training, but when we go out on the pitch, it’s just like we never met each other. “Terry came in and there were a few players that were down and were thinking about leaving. He put the arm round the shoulder, got them back playing and got the confidence back up. Those few players he put his arm round are probably the regulars now. At 21, Kavanagh has already learned to deal with his fair share of setbacks in the game. Growing up in Navan, he previously played with Drogheda U19s, but tore his cruciate while there and missed 18 months of action as a result. Upon returning, he spent a few months playing with Drogheda Town in the Leinster Senior League before Athlone came calling just before Christmas. Does he now regret making the move? “It was a learning experience, ” he says. “For someone that’s trying to work 40 hours a week and get to training and get time off for matches, you’re not getting anything from the club financially, it’s very draining driving up, trying to get there to play and you’re not getting anything from the club. “I was working in River Island as a manager for a while, but when I signed with Athlone, I had to leave, because I wasn’t getting time off for football. Now I’m just working as a sales consultant in the Carphone Warehouse, it was just to keep me ticking over while I was playing with Athlone. In the past two seasons, Athlone have endured countless problems off the pitch. There were the allegations of match-fixing, an issue which pre-dates Kavanagh joining the club, but has still yet to be fully resolved, while there is also a High Court battle revolving around the ownership of their stadium. Kavanagh is also expecting to walk into a better situation than the one he just emerged from. Finally, given all he has experienced, does Kavanagh have any advice for young players who could potentially face similar problems in the future? If you ever get a chance at League of Ireland, don’t just jump at it straight away. Just sit down, talk to your parents, get advice off them or former coaches. Don’t jump straight into it, because you can jump straight into it and it doesn’t work out. I got lucky, because Drogheda came calling as I left. If it makes you fall out of love with football, it can be a bad thing, because you might never go back. My mam and dad feared that when it was getting so bad, I wouldn’t go back to play football. “There were people from Navan at a few games. They were away on holidays [closeby] and said it to my parents after that how they knew by my body language that I wasn’t enjoying playing football anymore. Email “'The only people who are in the stands are family of the players. There's no support at all'”. Feedback on “'The only people who are in the stands are family of the players. There's no support at all'”.